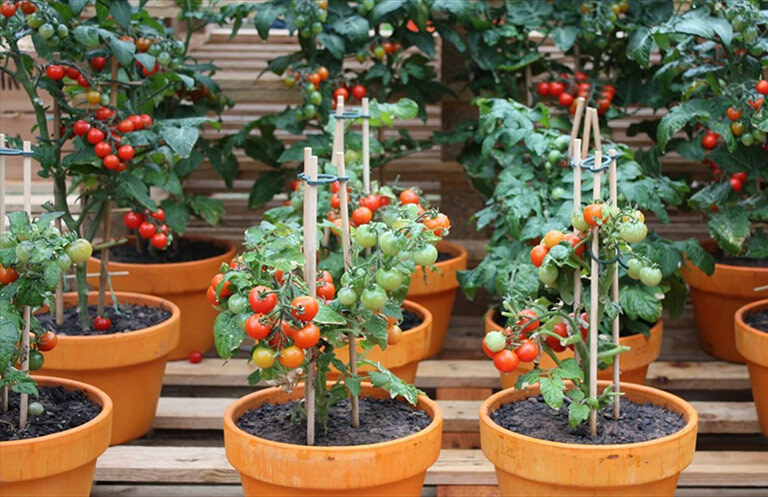 Any vegetable that grows in the ground can be grown in a container. But some crops, such as corn and pumpkins, may not be worth the effort. 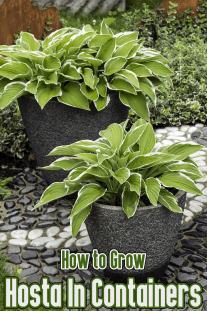 You don’t have to stick with so-called patio (dwarf) varieties. 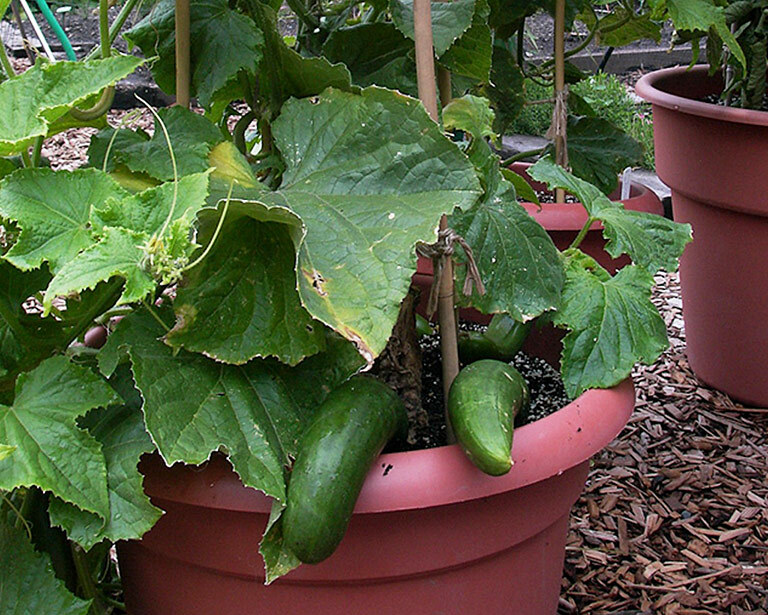 Most standard-size vegetables are suitable for container culture. For beans and carrots, plan to sow seeds directly in the soil-filled container. 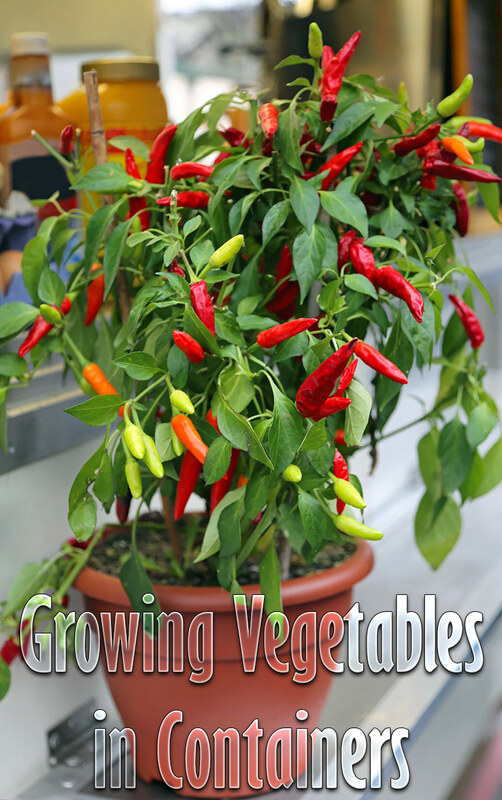 Grow other types of vegetables from seed, or purchase ready-to-plant s. Eggplants, peppers, and tomatoes started from seed take about eight weeks to develop seedlings ready for transplanting. Soil temperature (at planting time): At least 60°. Spacing: Direct-sow seeds 2-3 in. apart. Pole beans are more productive over the long run than bush beans (which produce their crop all at once). Train the 6- to 8-ft.-tall vines on a trellis or tepee made from bamboo poles. 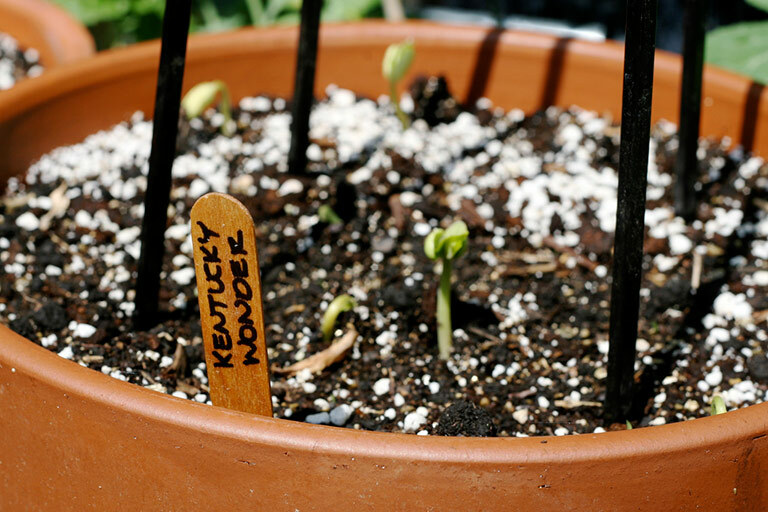 Try ‘Blue Lake Pole’, ‘Helda’ romano, or heirloom ‘Kentucky Wonder’. Soil temperature: At least 55°. Spacing: Direct-sow seeds 1/2-1 in. apart; thin seedlings 1-2 in. apart. 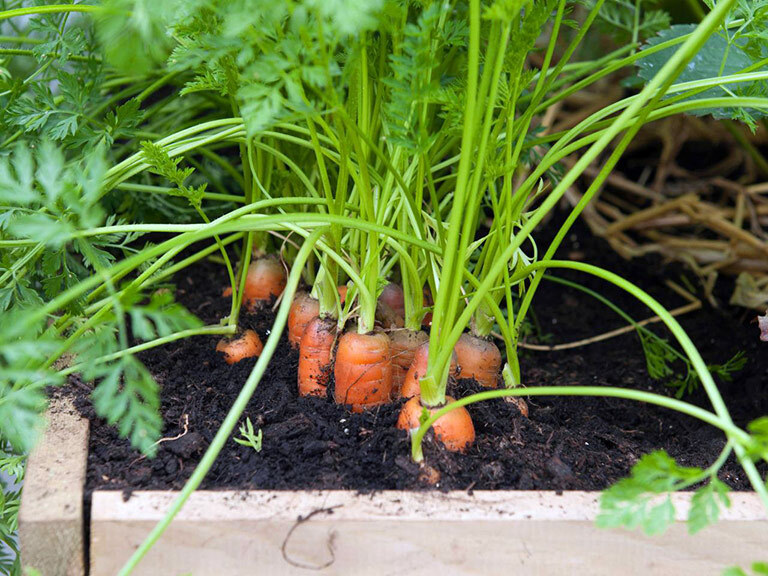 Choose a deep pot for carrots with long roots, such as ‘Nantes’ half-long type (7 in. long). Shallower pots are adequate for shorter carrots such as ‘Short ‘n Sweet’ or round ones like ‘Thumbelina’. Don’t let the soil dry out. Soil temperature: At least 70°. Spacing: One plant per pot. Bush types like ‘Bush Champion’ and disease-resistant ‘Salad Bush’ take up half the space of trailing types. ‘Lemon’ cuke also bears well on a trellis. 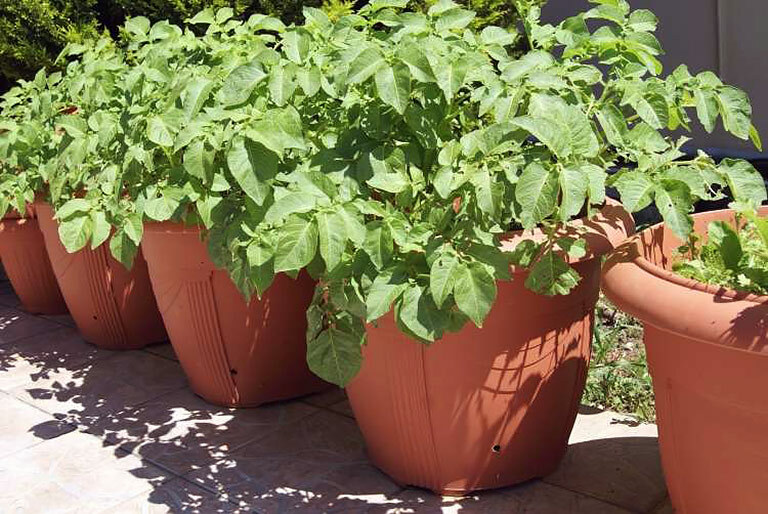 Spacing: One or two plants per pot. 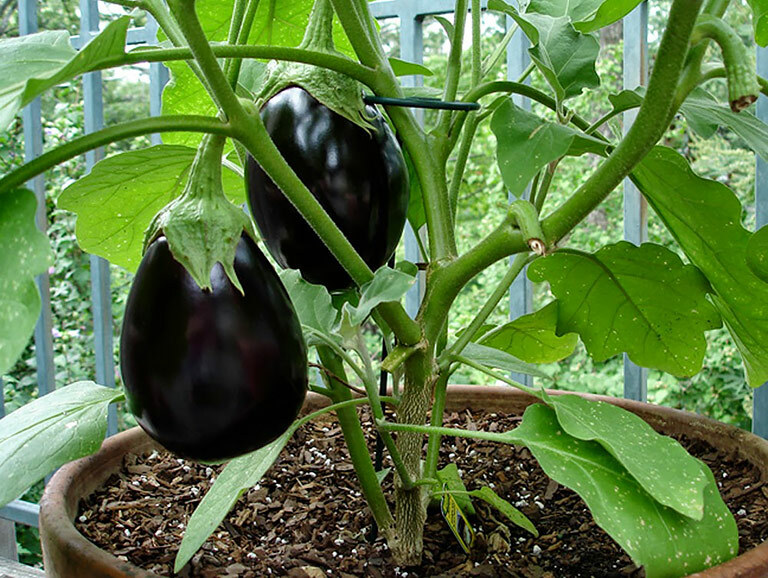 With their colorful fruits and attractive foliage, eggplants have outstanding ornamental value. Try ‘Black Beauty’, an American heirloom with bulbous, purple-black fruits, or ‘Little Fingers’, an Asian type with slim fruits. Soil temperature: At least 60°. Choose from an amazing array of colors, shapes, and heat levels, from mildly spicy ‘Anaheim’ to searing hot ‘Thai Dragon’. 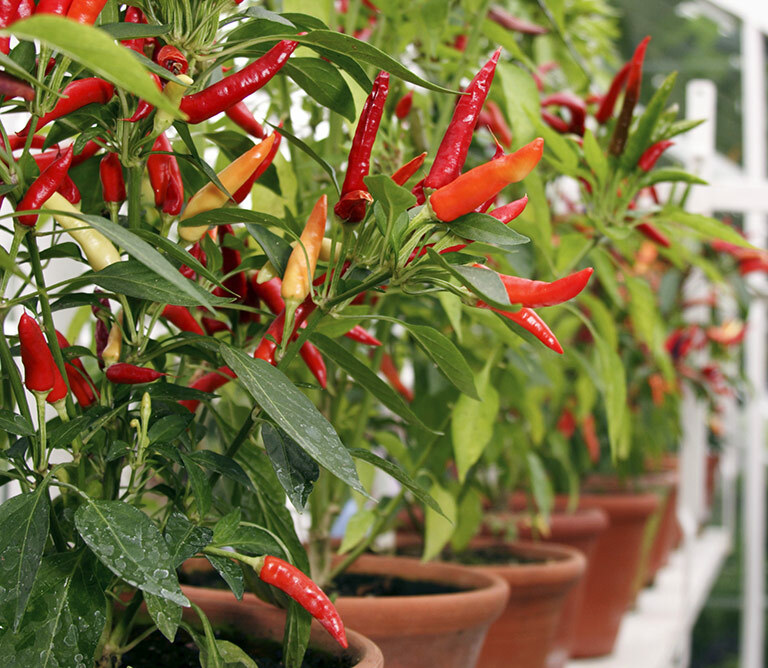 Among sweet peppers, try ‘Ariane’, an orange bell, or ‘Giant Marconi’, a long, red one that’s great for grilling. Soil temperature: At least 45°. Spacing: Plant tubers 6 in. apart. Potatoes are productive if there’s ample room for tubers to develop. Bury seed potatoes in an 8-in. layer of soil at the bottom of the pot. 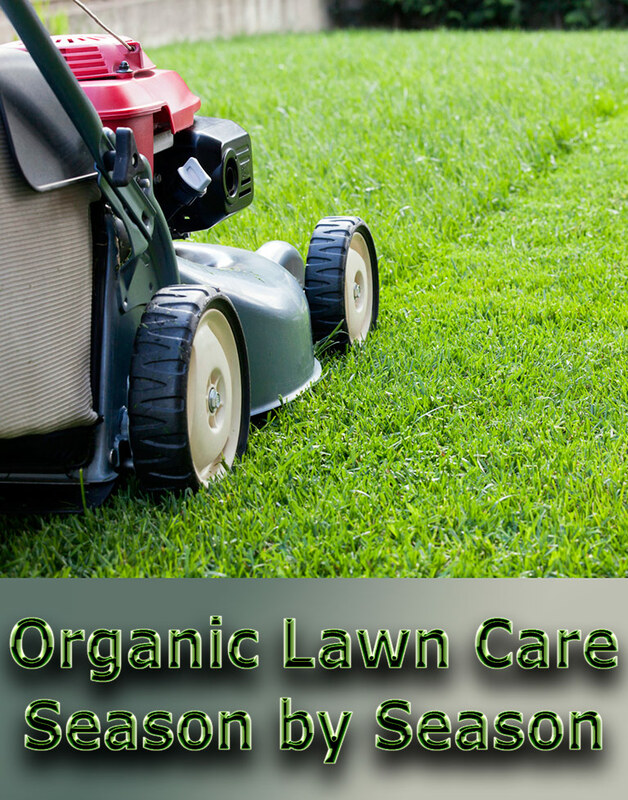 As plants grow, pile more soil up to the top set of leaves. Try small- to medium-size ‘All Blue’, ‘Red Pontiac’, or ‘Yukon Gold’. Summer squash is more productive than winter squash. 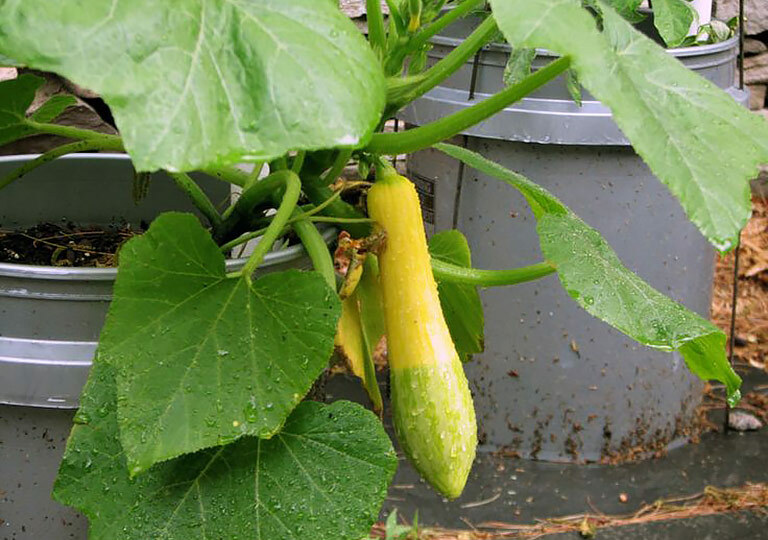 Grow compact varieties like ‘Gold Rush’ yellow zucchini, ‘Spacemiser’ green zucchini, or ‘Sunburst’ scallopini. Use small wire cages or stakes to support determinate types (2- to 3-ft.-tall varieties that produce their crop all at once); try ‘Bush Celebrity’. Use sturdy 5-ft.-tall cages for indeterminate types (tall kinds that produce fruits all season) such as ‘Early Girl’.